The effects of diesel fuel and three lubricating oils on microbial communities in marine sediment were investigated in a field experiment at Casey Station, Antarctica. 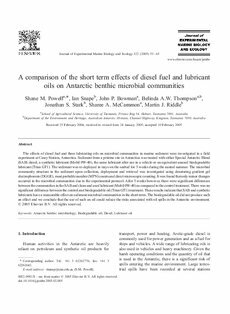 Sediment from a pristine site in Antarctica was treated with either Special Antarctic Blend (SAB) diesel, a synthetic lubricant (Mobil 0W-40), the same lubricant after use in a vehicle or an equivalent unused biodegradable lubricant (Titan GT1). The sediment was re-deployed in trays on the seabed for 5 weeks during the austral summer. The microbial community structure in the sediment upon collection, deployment and retrieval was investigated using denaturing gradient gel electrophoresis (DGGE), most probable number (MPN) counts and direct microscopic counting. It was found that only minor changes occurred in the microbial communities due to the experimental protocol. After 5 weeks however, there were significant differences between the communities in the SAB and clean and used lubricant (Mobil 0W-40) as compared to the control treatment. There was no significant difference between the control and biodegradable oil (Titan GT1) treatment. These results indicate that SAB and synthetic lubricants have a measurable effect on sediment microbial communities in the short-term. The biodegradable oil did not produce such an effect and we conclude that the use of such an oil could reduce the risks associated with oil spills in the Antarctic environment. © 2005 Elsevier B.V. All rights reserved.